TNA wrestler Jeremy Buck (Nick Jackson) of the Generation Me tag team reportedly suffered a concussion at last night's Pro Wrestling Guerrilla show in Southern California. Jeremy (real name Nick Massie) was taken to a local hospital after the PWG show where a CAT scan came back negative on head trauma. Jeremy suffered the concussion during the main event finals of the DDT4 tag tournament. According to reports from the show, Nick left the match after taking a blow to the head, then came back and finished the match. 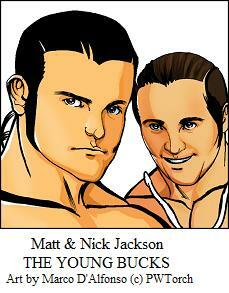 The Young Bucks dropped the PWG tag titles in the finals of the tournament, losing to El Generico and Paul London. Both teams were wrestling their third match of the night. -- SEE ALSO: PWG DDT4 tournament show results.